that requires Adobe Flash player which can downloaded from here. Unknown. Chair purchased from St George’s Antiques, Battery Point in 1997 with the assistance of the Friends of the Tasmanian Museum and Art Gallery. In Tasmania, the name ‘Jimmy Possum’ is used to refer both to this type of chair and to a particular or apocryphal chair maker working in the Deloraine area in the north of the state in the late nineteenth and early twentieth centuries. It is probable that the name ‘Jimmy Possum’ represents a number of bush craftsmen working in the area at that time, rather than any single individual. 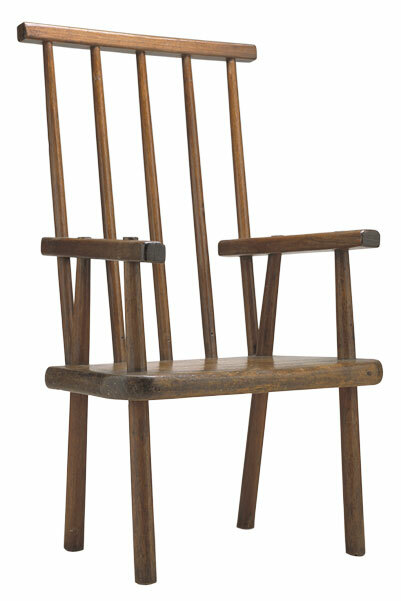 The chair is essentially a vernacular version of the well-known British Windsor chair. Contemporaneous makers of similar chairs in the area have been identified: William and George Larcombe (n.d.) and Michael Cook (c. 1860–1920), both of Deloraine. The chair’s manufacture involved minimal processing of materials and very simple tools. The legs and back spindles have been shaped with a knife, spokeshave or drawknife; the seat is a simple flat slab with rounded corners and edges; and the chair back and arms are square sections with minimal rounding and shaping. The solid seat is utilised as a structural core. By jointing the legs through the seat to support the armrests, and jointing the framing of the chair-back through the armrests and the seat, the maker has integrated the whole structure to resist the stresses placed on it by the sitter. The use of wedged construction has eliminated any need for glue. Armchair with high back and a seat made from a single, rectangular slab of pine. The chair legs taper and pass through the seat to support the armrests, into which they are through jointed and wedged. The chair-back is made from five straight spindles narrowing slightly at their ends to joint directly into the back of the seat and into a slightly shaped rail forming the top of the chair-back. The outermost spindles are jointed through the extended armrests and into the seat to brace the back. The legs and spindles have been shaped rather than turned and the seat and chair-back have minimal shaping and rounding. The Tasmanian Museum and Art Gallery seeks to build a comprehensive representation of decorative arts made in Tasmania throughout the colonial period. Many of the objects in this collection are similar to contemporaneous items made in Britain, but are distinguished by an idiosyncratic inflection derived from the colonial context of their production. The Jimmy Possum chair is an example of the transferral and adaptation of vernacular traditions. The chair is a Tasmanian version of the Windsor chair, originally a vernacular form popular in Britain and North America. It demonstrates the tradition of using readily available materials and very simple tools to produce a sophisticated, integrated and robust construction. This website was made possible through the generous support of the Gordon Darling Foundation, which provided funds for research, equipment and website design.